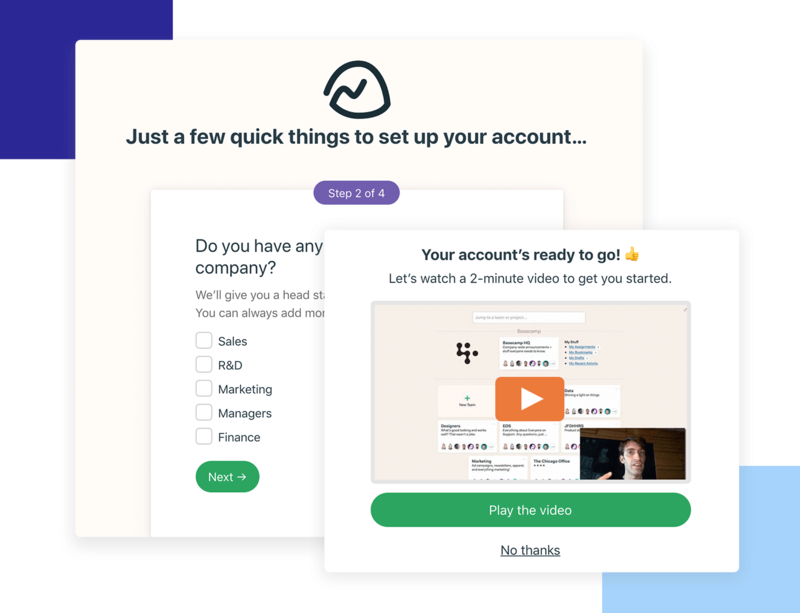 Editor’s note: we’ve updated this list with 5 more awesome examples of user onboarding experiences, so you can have a complete list with products that do onboarding right. Intuitive user interfaces are the Holy Grail for UI designers and digital product managers. But it’s not always realistic to expect 100% of users to dominate a mobile or web app’s features from the get-go. This is particularly true for intricate enterprise application interfaces requiring intimate knowledge of an organization’s workflow; however, it can also be true of relatively simple products aimed at a wide variety of users, or a product with frequently updated features. All users appreciate a helping hand to get them started on a product or feature sometimes. And that’s where user onboarding comes in. The benefits of building user-centric onboarding flows revolve around the impact on user retention and user engagement. Whereas ineffective onboarding leads to high churn rates, decreased product renewals and a disappointing rate of conversion from free products to paid versions, good user onboarding flows reverse downward trends, improving user return rates, engagement and sales funnel strength. A user onboarding flow should guide users through potentially confusing or difficult moments, improving their experience of the product and converting them into loyal users. If all this is reminding you of Clippy, Microsoft’s well-meaning but intrusive Office Assistant paperclip, the it’s time you got up to date with these 5 examples of inspiring user boarding flows that boost user rentention and improve user experiences. When we interviewed Basecamp‘s UI Designer Jonas Downey, he told us that his team aims to make Basecamp “an enjoyable collaborative space“. That design idiology is obvious from Basecamp’s onboarding process for new users: starting from a landing page with a distinctly approachable vibe (witness the client testimonials and distinctly homey design aesthetic), Basecamp moves users along a conveyor belt that includes account creation, and a personal note from Basecamp’s friendly looking CEO. This is all great, but then comes the real onboarding juice: the flow asks new users which projects they’ve got going on right now, and takes them straight over the project template they need. Say you want to set up a company HQ, a central point for shared documentation and news – Basecamp directs new users through that set up in 3 steps. Basecamp also provides new users with sample projects in the Account page, which users can use as templates to build out their own projects. Users are encouraged to upload information, add members and start working with the tool almost without realizing. The onboarding flow is unobtrusive, useful and helps boost retention by ensuring users upload documentation sooner rather than later. Here at Justinmind, we’ve just updated our onboarding experience for first-time users. Now, when new users download our wireframing and prototyping tool and open the web app, they are presented with two options: traditional ‘full mode’, the full user interface complete with Justinmind’s complete range of floating palettes and actions; or newly-introduced ‘beginner mode’, which guides users through the interface with interactive tooltips linked to our support section and YouTube tutorials. Beginner mode users are guided through features and floating palettes step by step and, once they feel up to speed, can easily switch to Full mode at any point. By adapting the onboarding experience to different user abilities, we can create a Justinmind experience tailored to user needs. Download Justinmind today. It’s free to try! Getting started with Netflix could be a nightmare for users: a potentially overwhelming number of movies and series to choose from, plus worries about data crunching and monthly payment, could make users reluctant to dive into the paid streaming service. Netflix cleverly assuages any uncertainties with its personalized onboarding flow. The landing page gets the payment thing out of the way first off, with the claim “Watch anywhere. Cancel anytime”. Savvy pricing presentation apart, Netflix’s user onboarding is strong on personalization. By asking new users to rate a selection of movies on a sliding scale, Netflix then algorithmically produces a list of recommended content in much the same way Amazon or Spotify does, to keep users moving through the app, discovering and engaging with content. Dropbox makes it incredibly easy to both understand the product’s USP, and to get started on file saving and sharing. Once users create an account and open the web app, they are walked through the process of user verification, document uploading and sharing in only 7 steps – Dropbox designers have chosen to present these steps in a progress bar at the top of the interface, to relieve user anxiety about the complexity of the onboarding process. In terms of textual content, Dropbox’s onboarding process favors clarity over wise-cracking; however, branding opportunities are leveraged in the cute illustrations, which lighten the mood without obscuring basic functionality. Language app Duolingo wastes no time in its onboarding process: users select their language and choose their goal right from the landing page. In asking new users to commit to a goal, Duolingo is cleverly tapping into behavioral science theories of goal achievement and commitment, in a bid to keep users engaged for longer. Kind of like Justinmind, Duolingo also provides new users with two options once they’ve set their language goal – they can start from the basics, or take a placement test. The experience thus becomes personalized at only the third interface step. Light-hearted tooltips then introduce the user to useful features based on their knowledge and chosen language. Duolingo’s user onboarding aims to get users started as soon as possible, and within 10 clicks users are deep into language learning. By enabling users to get into core functionality from the start of their app experience, Duolingo presents itself as highly intuitive. Most designers will avoid Canva because it can’t compete with advanced, professional tools such as Photoshop or Illustrator. But while its use for professional designers is quite limited, there is something to be learned from its user onboarding flow. 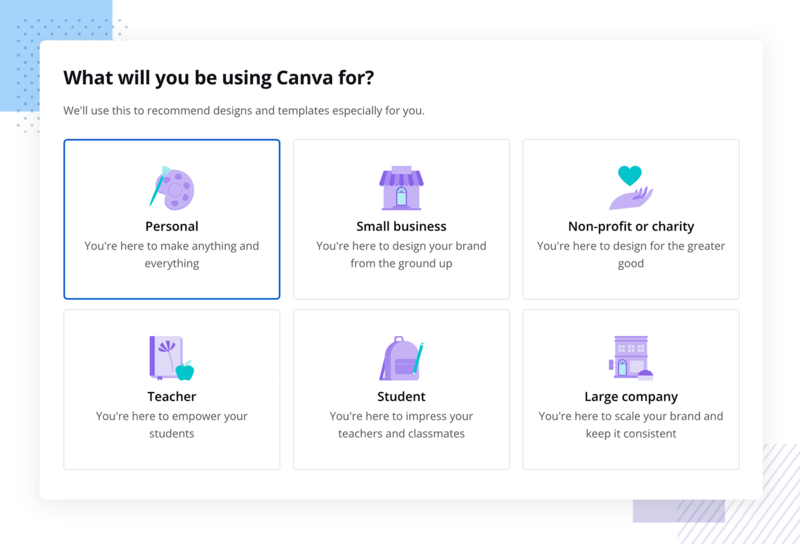 The real upside of Canva’s user onboarding flow is that it customizes the experience according to the user’s answers to the brief questions the platform presents. Why are they using Canva? What do they hope to create? What is their occupation? By adapting the flow to user’s preferences or profession, the resulting tutorial resonates more deeply with all new users. 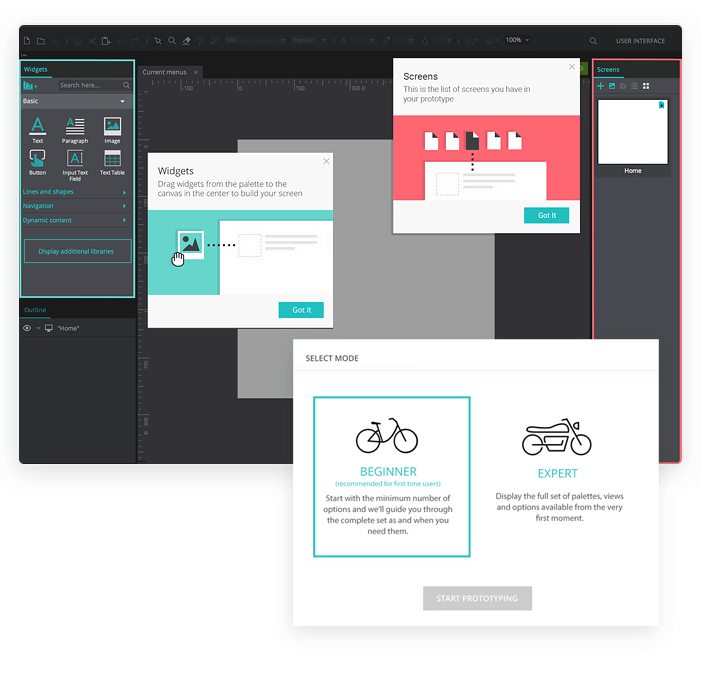 The tutorial takes the form of a brief video (with no audio) that shows you how to create a design you’re interested in, making the user interact with the tool immediately with little chance of users getting lost. The video shows users both how to operate the tool and the possibilities it brings to the table – the ability to create designs that were, until now, the domain of professional designers only. One of most popular productivity tools out there, Evernote has quite the reputation for its great user onboarding flow. The reason why we love their onboarding experience is that it shows off all the key advantages and selling points the product has, while never crossing over to a long and boring onboarding flow that will lose users on the way. You can find out more about Evernote reading our case study. The initial part of the user onboarding reminds users the big selling points of the tool, using great custom illustrations that add visual storytelling to the experience. The next part requires action from the user, where the tool takes the user by the hand on a short tour of the main features. 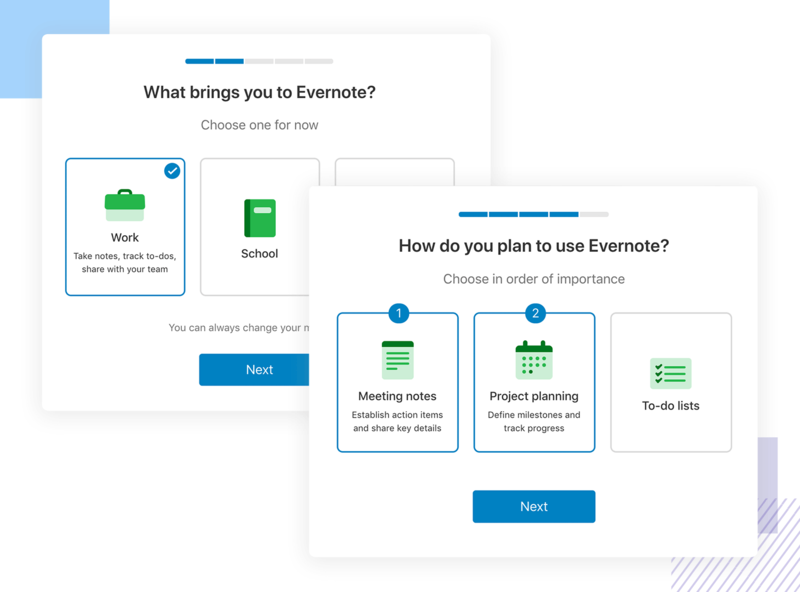 We love that Evernote gives users the option to bypass the onboarding experience altogether – with a product that stretches across several versions, you need to consider users that already have one of these versions. People that are used to the desktop version of Evernote are unlikely to need a tour of the mobile app – and forcing users down a certain path is always tricky. Slack’s messaging platform is widely used in the corporate world due to how handy it is for team communication. Their onboarding experience is quick, to the point and interactive. Brand new users are asked to set up the basics such as the name for their Slack, and are then put into contact with a chatbot that walks them through the tour. The chatbot both shows the main features and asks for further information from the user – a clever way to get data from the user in a smooth, interactive way. Popups are used to highlight all the most important features, leaving the user to discover the smaller functionalities in their own time. The microcopy is well thought out as it offers explanation to every field users need to fill in, giving context to the effort demanded from users. 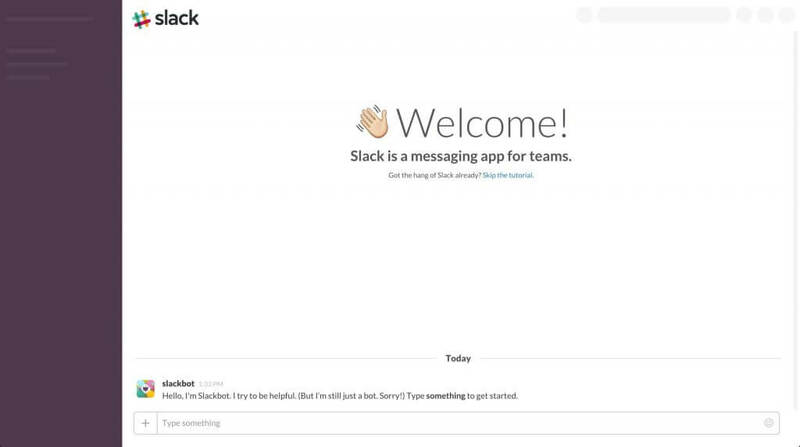 A great side of the user onboarding experience Slack has is the lack of unnecessary steps. There’s no asking for permission to send notifications, no verifying of emails or even setting up a password until users are settled into the tool. That way, users aren’t distracted by anything that can interrupt the onboarding flow. Lookout is a mobile security app that has a great interactive user onboarding experience. Instead of offering video tutorials or waves of emails with information on the tool, Lookout settles for a 4 question quiz. The quiz is smartly designed to highlight the key selling points of the tool, asking things such as what the user would do if they lost their iPod. 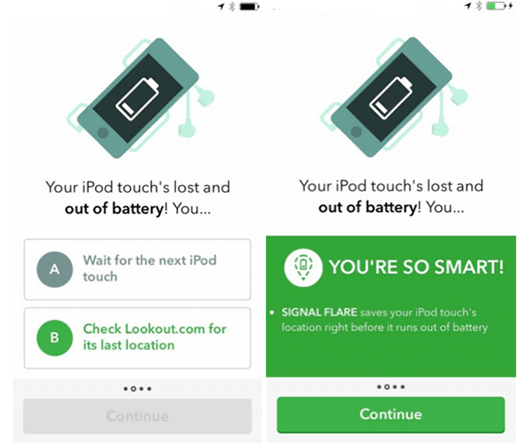 Depending on the user’s reply, Lookout either links the correct answer to their corresponding feature or offers an explanation of why assuming the iPod is lost forever is not the only option – not when you have Lookout, that is. The world’s most commonly used messaging app bought by Facebook back in 2013 is still king of the app store today. Planning user onboarding in messaging apps can be tricky, mainly because the tool requires the user insert quite a bit of personal data and grant the app permissions to do quite a bit. The clear example is the struggle to get users to enter and validate their phone number in the platform, or grant access to their contacts or files. These steps can overwhelm the user, or make them sweat at the thought of giving so much liberty to the app. WhatsApp makes quick work out of the onboarding process, using clever ways to decrease the time this process takes. 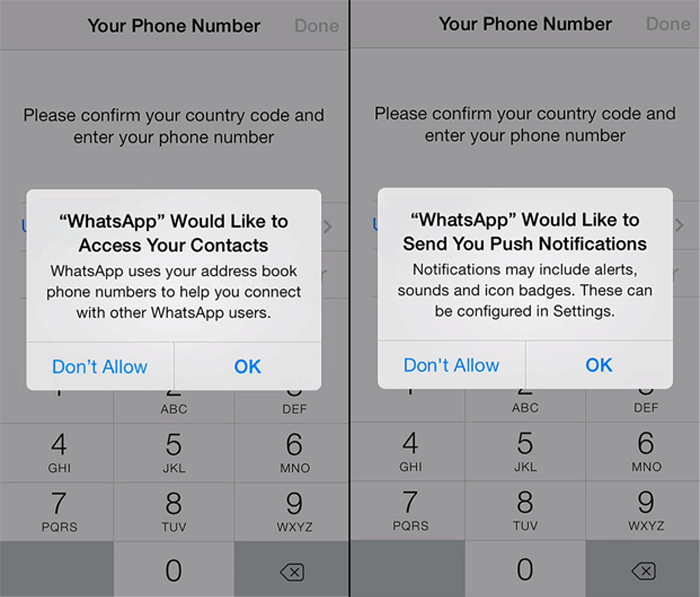 The best example is how WhatsApp can automatically detect the verification code sent to your phone, so users don’t have to go digging their messages for it. This is a great idea not only because it makes the whole thing easier for the user, but because it closes the window of distraction users see when they close the app to look for the message. The user onboarding experience here is good, because aside from the granting of permission to the app or inserting your phone number, there is very little the user actually needs to do. On the few steps the user needs to do something, there is always some text offering guidance or context to that action. This is a huge plus, especially when dealing with older users who aren’t necessarily tech-fluent. Good user onboarding isn’t just about getting users to interact once and only once with your app; rather, it’s about getting them to come back to your product again and again, until it becomes an integral part of their online lives. Designing and prototyping onboarding flows is crucial to creating meaningful onboarding experiences, so get inspired by these 5 examples and start prototyping your own user onboarding flows. Check out these tips and tricks on creating user onboarding flows for more ideas on improving conversion and retention.